Last year, 39 people died in farm-related accidents in Illinois, the most since 2001. More than one-hundred Illinois farm families will be served complimentary hot lunches by Farm Credit Services of Illinois during next weeks' National Farm Safety & Health Week. But more than food will be delivered to farmers during their busy harvest season; a message about farm safety will be included during each meal. This year marks Farm Credit's twelfth annual "Meals in the Field" program. Farm Credit Services of Illinois established the program in 2000 to help promote farm safety during the harvest season. Each of Farm Credit's branch offices selects at least one farm family to provide a lunch meal on each weekday of Farm Safety Week. 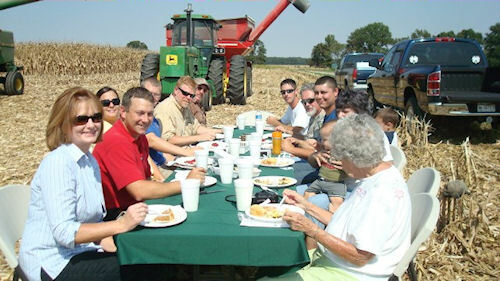 An Edgar County farm family enjoys a meal in the field courtesy of Farm Credit Services of Illinois. The Farm Credit staff serves the lunch wherever the farmers are working that day. Each "Meals in the Field" host family will also be provided a Farm First Aid Kit produced by the National Education Center for Agricultural Safety compliments of Farm Credit. The durable and weather-resistant kit is specifically designed for farm injuries and is equipped with items such as an isothermal blanket, ice packs, a finger splint, and eye wash containers. "Farm Credit salutes the hard working farm families in Illinois. We want our meals to give farmers a compelling reason to climb off the combine or out of their grain truck to take a quick and refreshing break during the long harvest work days," says Dave Owens, President and C.E.O. of Farm Credit Services of Illinois. "We remind farmers that it pays in the long run to slow down enough to take breaks and drink plenty of water to help them stay alert while operating farm machinery." Unfortunately, the past year has been one of the deadliest on Illinois farms. From July 1, 2010 through June 30, 2011, 39 farm-related deaths occurred. That is the most Illinois has experienced since 2001. Twenty-one farm-related deaths occurred in 2009-10. The leading cause of death is tractor runovers and rollovers; roadway collisions rank second. The theme for the 2011 National Farm Safety and Health Week is "Safety Counts—Your Community Depends On It." Illinois is making a special focus on community safety efforts concerning grain bin accidents and suffocations. Purdue University reported that 51 men and boys were engulfed in grain bins throughout the United States last year; twenty-six of those individuals died. Illinois led the nation with 10 grain bin accidents and five deaths. All Illinois farm families that reside in the southern 60 counties are eligible for "Meals in the Field" by registering with a Farm Credit Services of Illinois branch office or on-line at http://fcsillinois.com/registration.html.